BRHS formed in 1998 to help the Brookings Animal Control Department find homes for stray animals. Prior to BRHS forming, there was no humane society/adoption group. The unclaimed, homeless cats and dogs from Animal Control are BRHS’ priority. Those unclaimed within a five-day holding period are surrendered to BRHS where they get the necessary wellness care and are spayed/neutered. Animal Control brings any sick or injured animals to BRHS for immediate care. 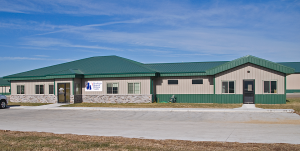 Brookings (South Dakota) Humane Society is an adoption center for dogs, cats and other small companion animals. BRHS supports the spaying and neutering of animals in order to prevent the overpopulation of unwanted animals – all of our dogs and cats are spayed or neutered PRIOR TO adoption! We do not euthanize for time or space. The Brookings Regional Humane Society is a tax exempt non-profit 501C(3) charitable organization. We do not receive funds from national humane organizations or the national or local United Way. We are not a government agency. We receive no funding from the state or the federal government. Your donations, endowments, memorials, and volunteerism are critical to the consistent care of the animals in our society. In 2013 BRHS was very fortunate to move into its present location across from the Brookings Airport. The building was built specifically to house animals and provides a separate dog kennel area, rooms to house cats, natural lighting, and proper ventilation throughout the whole facility. There are also medical isolation, quarantine, treatment, and surgery rooms. BRHS has been recognized for and has won multiple awards from both city and national organizations, including several Dog Rescue Awards and a nomination for the Governor’s Award. To protect animals by finding permanent loving homes through an aggressive adoption outreach program. To educate the community about companion animals and promote responsible pet care and pet ownership. To promote the reduction of pet overpopulation through spay/neuter education and programs. In the present location, BRHS helps more animals than ever before, but to continue, this non-profit needs more help now than ever. Your donations enable BRHS to continue its mission of helping homeless, unwanted animals in the Brookings region. BRHS would not exist, saving thousands of animal lives, if not for the on-going, generous support from the community.